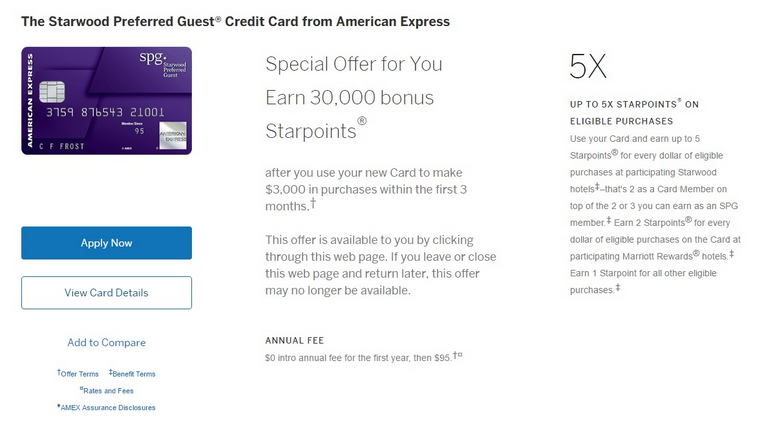 It looks like the Starwood Preferred Guest American Express card are again offering an increased 30,000 point sign-up bonus. At this point in time the offer appears to be only showing for some on the personal version of the card, but I would not be surprised if some are able to see it also on the business card soon. Overall this is a great sign-up bonus that is offered every now-and-again from Amex, and with the SPG/Marriott merger moving forward this is the perfect time to apply. The SPG Amex cards are among the most flexible hotel credit cards available and the points are valuable for both hotel stays and flights. Starpoints can be transferred to numerous valuable airline programs and when you transfer 20,000 points you’ll earn a 5,000 point bonus. This makes the 30,000 points worth 35,000 airline miles of your choice. The 30,000 point sign-up offer is only showing up for some and it may help to try a different browser (Firefox vs. Chrome) or to refresh the page several times. You can also try using incognito or private browsing mode. The normal offer on these cards is 25,000 Starpoints, but historically every year the card has offered a limited time increased offer of 30,000 bonus points. If you’ve been thinking about grabbing this card now is a great time to do so! Starwood points are among the most versatile hotel points out there and hands down have the most valuable and numerous airline transfer partners of any card. Many hotel credit cards have a low value transfer rate to airline miles, but you will get a 1:1 transfer when you transfer Starpoints to most airline partners. The increased 30,000 bonus point sign-up offer is a great deal for anyone who has yet to have the Amex SPG cards. Remember Amex has a rule that you can only earn the sign-up bonus once per card, so if you have had either version of the card before you are not eligible to earn the sign-up bonus.